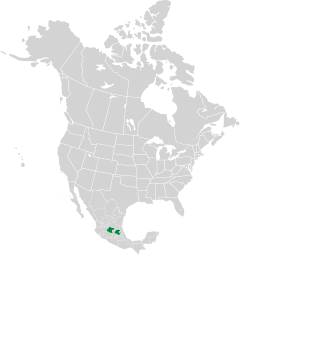 These cacti are natives of the Mexican states of Hidalgo and Guanajuato. 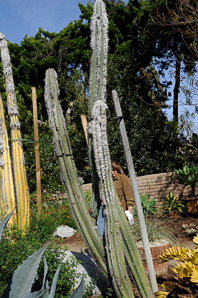 Identification: Forming tall columns up to 49' (15 m) high, and branching only at the base, these cacti make an imposing statement. Columns contain 20-30 ribs, and are up to 12" (30 cm) in diameter. 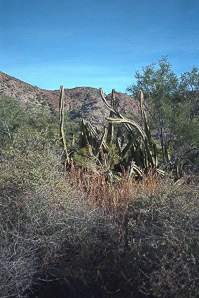 Fine white spines in groups of 20-30, are 2-4½" (6-12 cm) long. 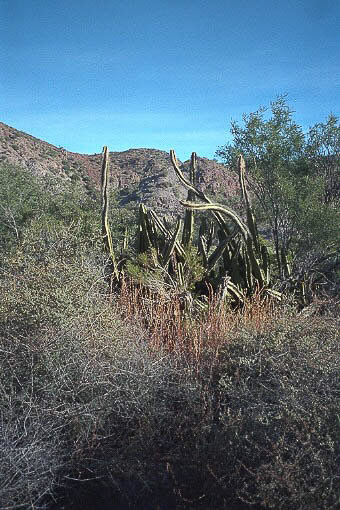 In addition, pseudocephalia resembling very fine dense white hair appears initially on one side, then covering the entire top of each column—hence the name “old man cactus.” (There is another old man cactus too though.) Funnel-shaped flowers 2½-3½" (7-9 cm) around are pink, tinged with yellow. Fruits are roughly oval, ⅞-1" (2.5-3 cm) around. Cephalocereus senilis description by Thomas H. Kent, last updated 12 Oct 2018.